Cooking lessens the strong, borderline bitter flavor of Swiss chard while tenderizing the leaves for a better texture. Select large, firm leaves with a bright green color for the best quality and flavor. Simple cooking methods combined with simple seasonings bring out the central flavor in the dish, or combine it with stronger flavors if you prefer to mask some of the leafy vegetable's bitterness. Swiss chard leaves can hold a lot of grit, but a thorough washing in cold water gets them ready for cooking. Fill a bowl with cold tap water and completely submerge the leaves, stirring them with your hands to dislodge any dirt, and then rinse and drain them before preparing. The hard stem that runs up the center of each leaf becomes tough after cooking. Fold each chard leaf in half and cut out the tough stem before cooking the chard. Sauteed chard leaves make a light side dish on their own, or you can mix them with other vegetables, meat, pasta or rice for a full meal. Slice the leaves into 1 ½-inch ribbons while heating olive oil or vegetable oil in a saute pan over medium-high heat. Simplify slicing by stacking the leaves and rolling them up, and then cut crosswise across the roll. Sauteeing an aromatic vegetable, such as diced onions or garlic, in the oil just until it turns golden brown and then adding the chard imparts more flavor to the dish. Pour stock or water into the pan to a 1/2-inch depth, and then add the chard. Saute the chard until the liquid evaporates. Cooked bacon, salt, pepper or red pepper flakes provide complementary seasoning options for sauteed chard. A brief dip in boiling water tenderizes the chard without overcooking it. Chop the leaves up into 2-inch sections while bringing a pot of water to a full boil. Boil the chard for no more than 3 minutes, and then drain immediately so the leaves don't overcook and lose their flavor. 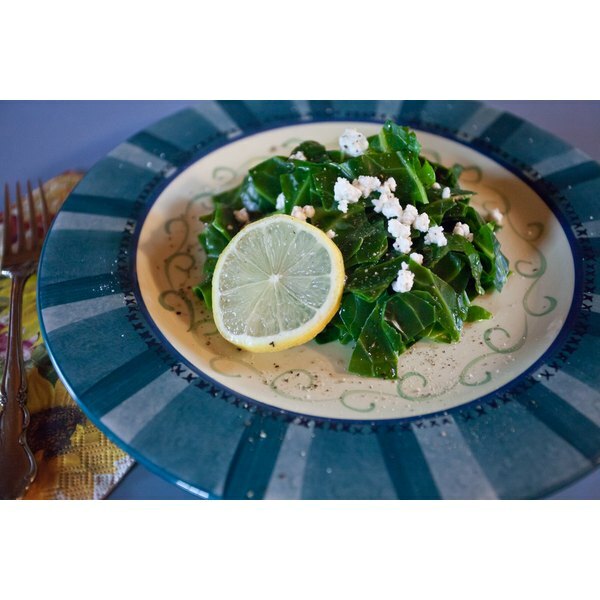 You can serve boiled chard plain or you can toss it with roasted garlic cloves, feta cheese, soy sauce or other seasonings of your choice. Boiled chard also adds color and flavor when added to a pasta salad or mixed with a warm pasta dish. Steaming retains all the flavor in the chard and the leaves don't become tough from overcooking. Place the chard in a steamer basket above 1 inch of boiling water in the steamer pot. Chard cooks quickly, requiring only 4 to 6 minutes of steaming from beginning to end. A squeeze of fresh lemon juice helps the chard retain its bright color from steaming, while adding a touch of citrus flavor. A dash of salt keeps this dish simple, or you can toss the chard with stronger flavors such as garlic, feta or black olives. How Long Should You Steam Kale?